Mobile Apps Unlocked (MAU) is Grow.co’s flagship summit for user acquisition and retention professionals and brands. Last year, 400 of the top mobile brands gathered for the only event of its kind – actionable content and world class relationship building in an environment where marketers outnumber vendors. Join the best minds in mobile as we dive deep into growth and retention strategies, marketing best practices, industry insights, and an agenda focused as much on ROI as the businesses who attend. 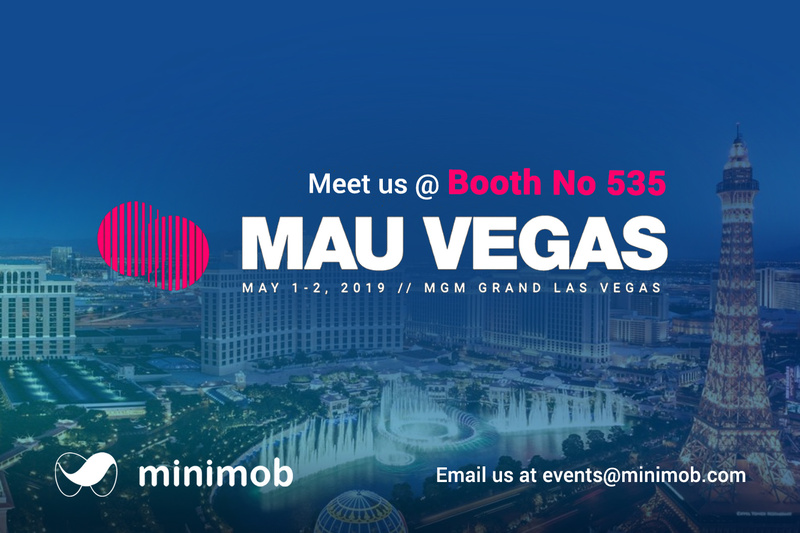 Minimob is a Silver sponsor on this year’s MAU serving you drinks and discussing with you all about #mobileadds. Email us at events@minimob.com or take part in our social media giveaway to get a chance to win a free ticket! Busy days coming … book your meetings now! This entry was posted in Announcements, Events and tagged #advertisers, #advertising, #advertisingagency, #advertisingplatform, #appexperience, #appinstalls, #appmarketing, #bestpractises, #developers, #emailus, #freeticket, #giveaway, #industryinsights, #lasvegas, #marketers, #mau19, #mau19vegas, #minimobexhibits, #minimobglobal, #minimobteam, #mobileads, #mobileadvertising, #mobilebiddingplatform, #mobilemarketing, #mobileplatform, #monetize, #productexecutives, #retention, #roi, #sponsoring, #sponsors, #strategy, #useraquisition, Apps, bookameeting, MAU, mobile, publishers on April 12, 2019 by Events. 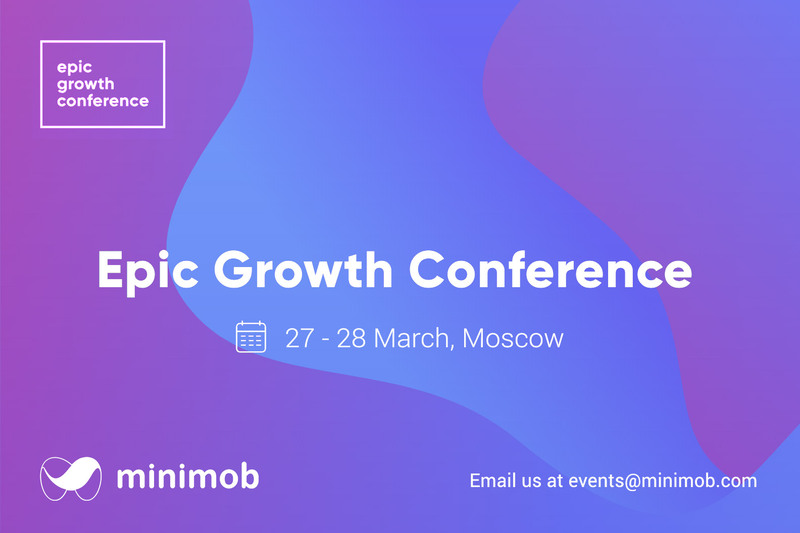 Over 1,000 participants, over 400 companies, 20,000 business meetings and C-Level networking are just some of the advantages of attending Epic Growth Conference in Moscow on the 27th and the 28th of March. 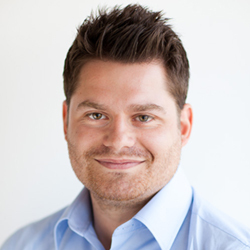 Minimob is a bronze sponsor and our team will be waiting to talk mobile with you. Drop by our booth or email us at events@minimob.com to book a meeting! This entry was posted in Announcements, Events and tagged #egc19, #emailus, #epicgrowthconf, #epicgrowthconference, #exhibits, #minimobattends, #minimobexhibits, #minimobglobal, #minimobteam, #mobileadvertising, #mobileapps, #mobilemarketing, #monetize, #moscow, #selfserve, bookameeting, booth, conference, Conferences, mobile, monetization, Russia on March 20, 2019 by Events. Email us at events@minimob.com to book a meeting with the #minimobteam! This entry was posted in Announcements, Events and tagged #advertisers, #emailus, #marketingplatform, #minimobattends, #minimobglobal, #minimobteam, #mobileads, #mobileadvertising, #mobileadvertisingplatform, #monetize, #selfserveplatform, #useraquisition, bookameeting, minimob, monetization, publishers on March 13, 2019 by Events. For more information take a look at our LinkedIn page. 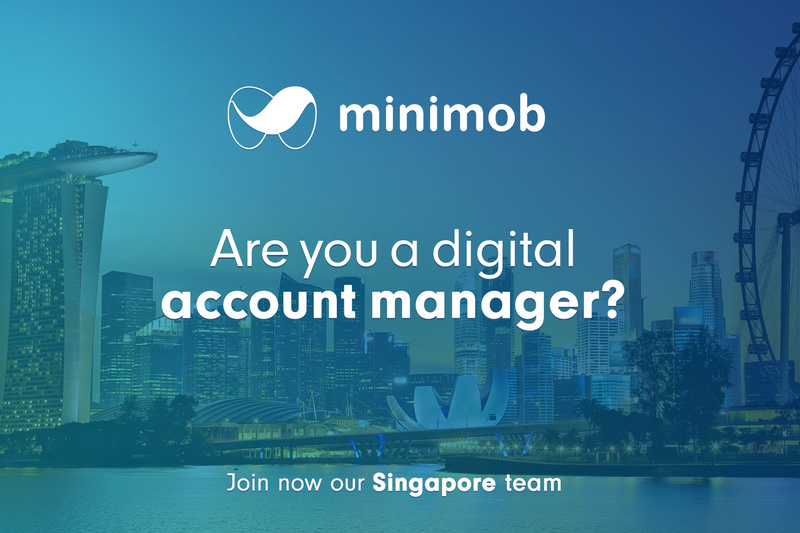 This entry was posted in Announcements and tagged #digitalaccountmanager, #minimobglobal, #minimobteam, #newjob, #positions, #singapore, #singaporeteam on February 28, 2019 by Events. MWC Barcelona (formerly Mobile World Congress) is the largest mobile event in the world, bringing together the latest innovations and leading-edge technology from more than 2,400 leading companies, with a highly-rated conference program assembling today’s visionaries to explore the hottest topics influencing the industry. The event also features extensive learning opportunities from dozens of partner-led programs, GSMA seminars, summits and more. Everything you need to know about the industry, today and beyond, can be found here. 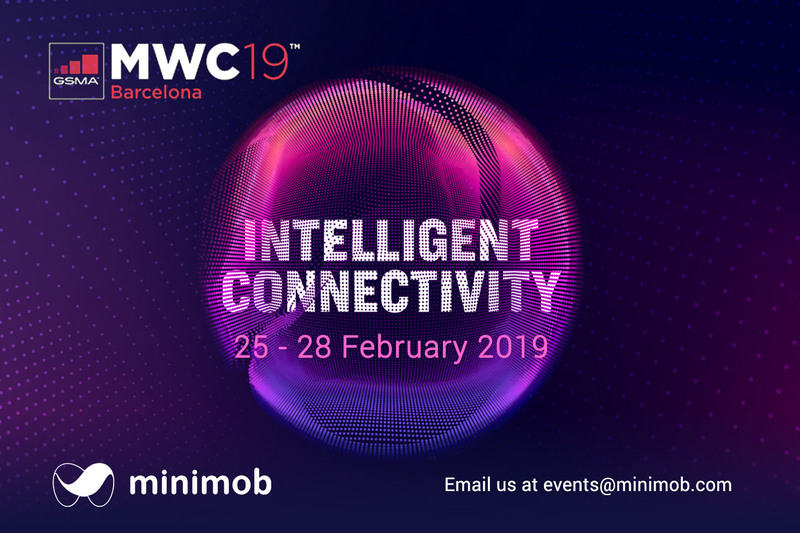 The minimob team will be there at 25th to 28th of February to chat with. Book your meetings at events@minimob.com! This entry was posted in Announcements, Events and tagged #ads, #advertisers, #advertising, #congress, #february, #internationalbusiness, #marketing, #marketingplatform, #meetings, #minimobattends, #minimobglobal, #minimobteam, #mobileads, #mobileadvertising, #mobilemarketing, #monetize, #performance, #performancemakreting, #performanceplatform, Barcelona, Events, mobile, MWC, spain on February 15, 2019 by Events. The White Nights Conference is an international business conference for game industry with the content across mobile, PC, console, web, AR and VR. The White Nights events attract influential game industry professionals and take place three times a year. Every year more than 4,000 visitors altogether attend the conference. 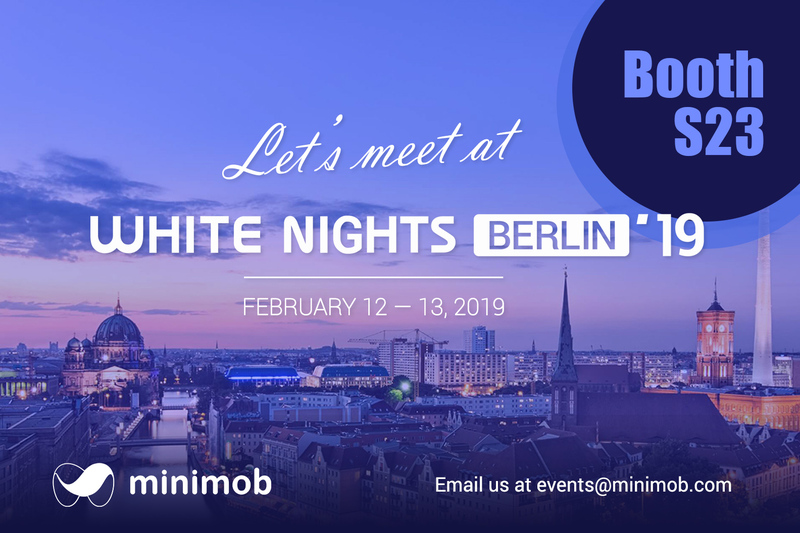 Minimob team will be waiting for you at booth S23 on the 12th and 13th of February, at the InterContinental Hotel in Berlin Germany to talk mobile. Hurry up and book your meeting with our team at events@minimob.com! This entry was posted in Announcements, Events and tagged #ads, #advertisers, #advertising, #germany, #marketing, #marketingplatform, #meetings, #minimobexhibits, #minimobglobal, #mobileads, #mobileadvertising, #mobilemarketing, #monetize, #performance, #performancemakreting, #performanceplatform, #WhiteNights, #wn, #wnconf, #wnconference, Berlin, conference, mobile, monetization on January 31, 2019 by Events. 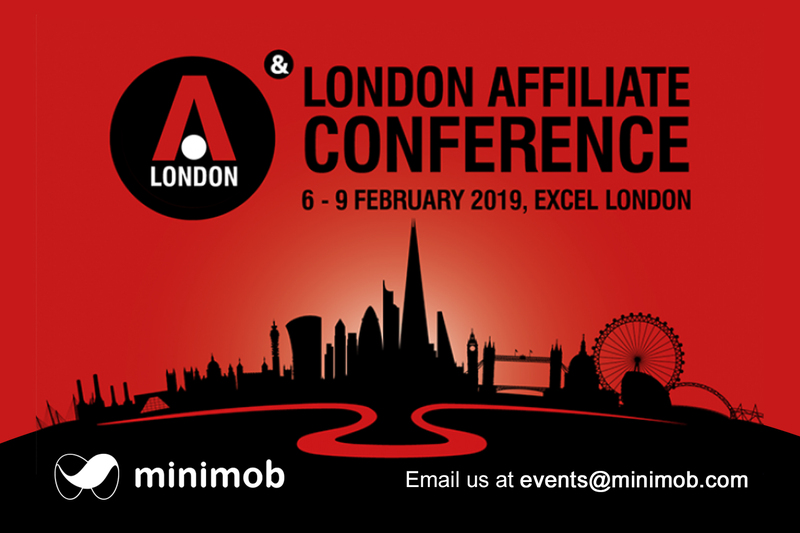 The London Affiliate Conference is taking place on the 6th – 9th February 2019 at ExCeL, London. LAC 2019 will attract over 5,200 delegates to London for four days of networking and learning. Returning to London for it’s 13th year in a row, LAC 2019 will prove to be the biggest edition yet. 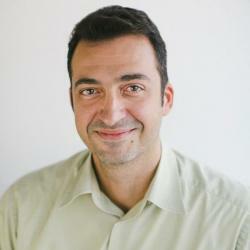 Minimob is already booking meetings at events@minimob.com! This entry was posted in Announcements, Events and tagged #advertisers, #advertising, #appinstalls, #delagates, #LAC, #LondonAffiliateConference, #marketing, #meetings, #minimobattends, #minimobglobal, #mobileads, #mobileadvertising, #mobilemarketing, #monetize, #networking, #performance, #platform, App, conference, Conferences, minimobsocial, mobile, publishers on January 28, 2019 by Events. The Mobile Game Awards aims to celebrate the best work done in 2018 by companies all across the mobile games ecosystem to help grow and improve our amazing $50 billion industry. Naturally the game developers themselves are center stage, but there’s a wide network of companies and services providing tools, data, and support to make it all possible – and all of these will get their deserved time in the limelight. 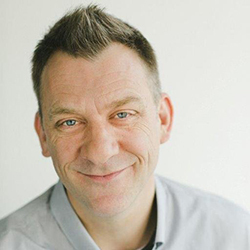 Which is why PG Connects will be unveiling a total of 15 awards at a gala VIP evening in London’s BAFTA 195 Piccadilly venue on 22 January and promoting the shortlisted awards entries extensively before then across media, social media, and mailing lists. 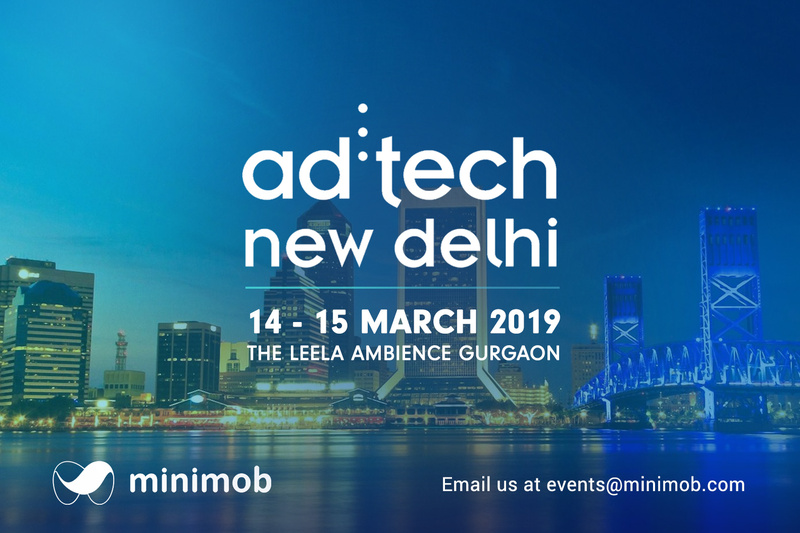 Minimob will be coming on board as a partner of the event and gets to be associated with the crème-de-la-crème of the industry, gaining extensive exposure before, during, and after the VIP event. 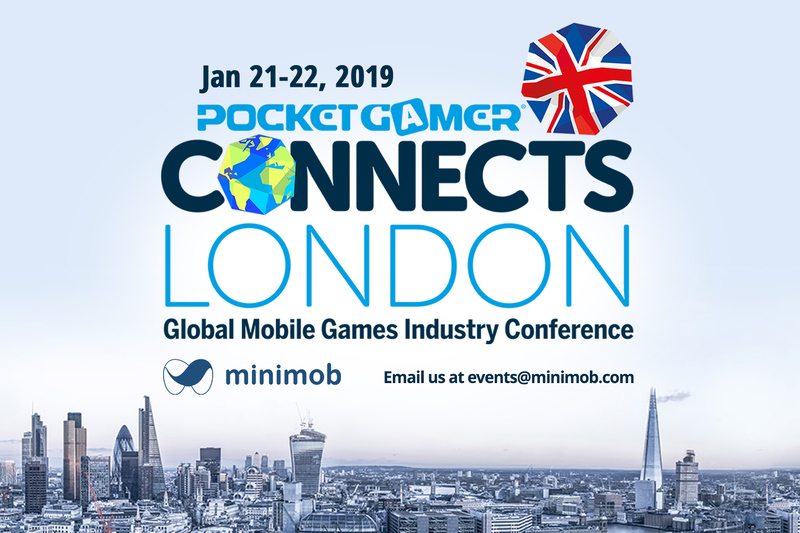 This entry was posted in Announcements, Events, Reminders and tagged # pglondon, #advertising, #awards, #developers, #marketing, #meetings, #minimobglobal, #mobileads, #mobileadvertising, #mobilemarketing, #monetize, #performance, #pgcon, #pgconnects, #pgmobileawards, London, publishers on January 18, 2019 by Events. Pocket Gamer Connects in London, UK and Pocket Gamer Mobile Games Awards on the 21st, 22nd and 23rd of January brings together representatives of key players from across the ecosystem – the marketplaces, the triple-A publishers, the indie developers, the tool makers and the analysts. Minimob is attending both and meetings are being booked already. 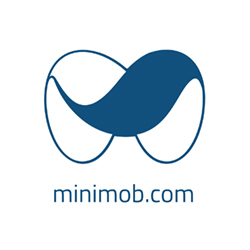 Hurry up and book yours at events@minimob.com! This entry was posted in Announcements, Events and tagged #advertisers, #advertising, #analysts, #awards, #developers, #gameservices, #marketing, #marketplaces, #meetings, #minimobattends, #minimobglobal, #mobileads, #mobileadvertising, #mobiledevelopment, #mobilemarketing, #monetize, #pcc19, #pcconnectslondon, #performance, #pgconnects, #pocketgamerconnectslondon, #revenues, #uk, London, minimobsocial, publishers on January 14, 2019 by Events. Happening bi-annually in Asia and in Europe, Affiliate World is the largest affiliate marketing mastermind you’ll ever experience. More than 3,000 of the top performance marketing professionals from around the globe attend for enhanced networking opportunities and above all, key takeaways to increase profits. 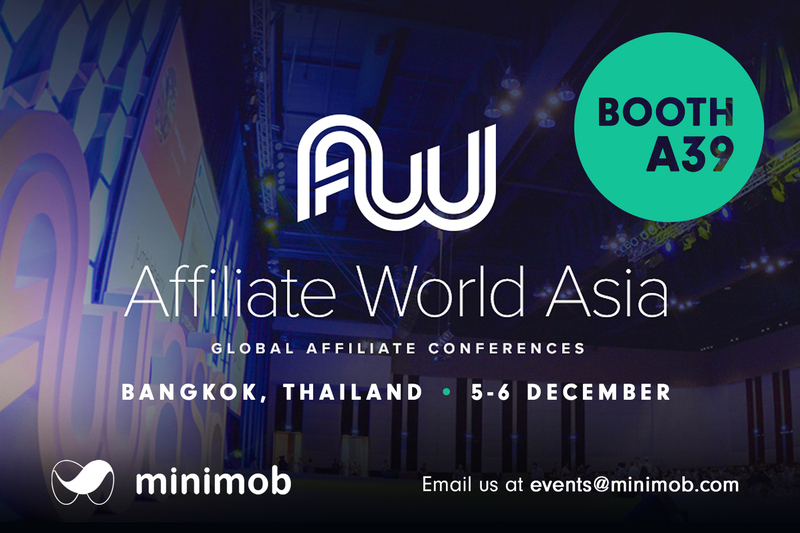 Minimob exhibits in AWA Bangkok on the 5th and 6th of December, booth A39. Our global team will be there! Book a meeting by emailing events@minimob.com! This entry was posted in Announcements, Events and tagged #advertisers, #advertising, #advertisingagency, #advertisingplatform, #affiliatemarketing, #AffiliateWorldAsia, #awa, #Bangkok, #emailus, #marketing, #marketingagency, #marketingplatform, #minimobglobal, #minimobteam, #monetize, #performance, #performancemakreting, #performanceplatform, #selfserveplatform, #Thailand, affiliate, bookameeting, minimob, monetization on November 21, 2018 by Events.